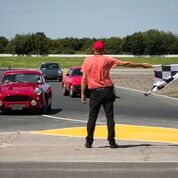 This is not a track day but a Starter Experience - an event for you to have fun in your car, increase your driving skills, gain confidence in both your own and your car's abilities. It is designed for absolute beginners or novice track day drivers who wish to gain confidence before venturing onto a race circuit. It allows you to explore your car's handling in a safe environment and to gain confidence under the watchful eye of a performance driving instructor. Numbers are limited to just 23 cars and only one car is active on each exercise at a time, minimising any risk to car or driver. After a group introduction and explanation of the day ahead, we begin with the high-speed bend activity. This mimics the situation of suddenly arriving at a bend when you are going too fast, the idea being to get around it under control and without spinning! Of course, being able to experience car control on a huge patch of tarmac is part of the fun and the experience. The instructor will encourage you to approach the bend faster and faster until you do reach this limit, he will then explain what to do to avoid the spin and you can go out and try it for yourself. Once everyone has made some progress with this the day moves on to two coned circuits providing an opportunity to try out your new found skills and explore the capabilities of your car. All of this is great fun, but of course is designed to give you the confidence to come away from the day with new skills and book your first track day. It is therefore intended for TRACK DAY FIRST TIME & NOVICE DRIVERS ONLY. No experience is required. No helmets are required. Just you and your car. North Weald event have 5 TR Register places available. Book here or by calling the office.